With Pulse Master musicians can slow down music,so they can learn new songs and techniques. 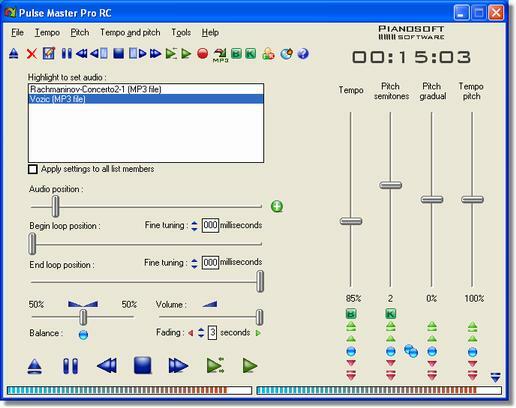 Independent control of music speed and pitch is made in real-time by playing it from a CD, MP3, WAV, WMA,Ogg Vorbis file. It is also used as flexible dictation machine,coreographers and dancers music speed adjusting tool, music teachers didactic mean,singers tool to change the music key to match their voice range or understand words in foreign languages. Qweas is providing links to Pulse Master 6.7 as a courtesy, and makes no representations regarding Pulse Master or any other applications or any information related thereto. Any questions, complaints or claims regarding this application Pulse Master 6.7 must be directed to the appropriate software vendor. You may click the publisher link of Pulse Master on the top of this page to get more details about the vendor.